One of the most vivid memories in my life was watching India win the Prudential World Cup in 1983 on television. The euphoria and celebration were infectious. Every neighbourhood rejoiced. Cricket was so much in the air. The next day, the image of Kapil Dev, then captain, holding the trophy splashed newspaper headlines. I was still in school but I remember being a part of this intrinsic cricket fraternity that was formed in the drawing room of our homes and spread beyond. Irrespective of how little you understood the game, the names of cricketers were more familiar than even Bollywood actors. Our first television was bought in 1982 and it helped sustain my infatuation with a few cricket heroes whose posters did colour my walls. Over the years, when cricket got embroiled in the match-fixing controversy, my interest in the sport waned. Save the India-Pakistan matches, the game became a ‘once-in-a-while’ affair for me. It was hard to get back to the sport with the same enthusiasm and, perhaps, a level of respect. Decades later, coming to live in Australia revived a distant memory of the game. The friendship between India and Australian is seen through the lens of cricket. My husband, an Australian, broke the ice with my neighbours in Delhi by sharing the same space and watching and discussing cricket in Netaji Nagar. Cricket, cliché though it may sound, broke barriers. 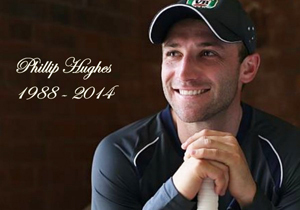 Recently, Australia and the world mourned for Phillip Hughes, an Australian batsman. And a non-cricket person like me was found wallowing in grief and staying glued to the television to watch every moment of his funeral. Hughes, as we all know, died after being knocked unconscious by a bouncer during a Sheffield Shield match at the Sydney Cricket Ground. The ball caused a vertebral artery dissection that led to a subarachnoid haemorrhage. Two days later he was declared dead. He was to turn 26 in a few days. On his funeral, the focus of the world descended once more for the last time in Macksville, a small country town where Hughes was born and brought up. Cricketing legends, heads of states and the whole town came out to celebrate a life and bid their final, honorable goodbye. The image of a weeping Greg serving as a pallbearer, a broken brother and sister reading out their letters to a sibling no more – was a pain shared by many despite not knowing him personally. The mortality of life and the fact that he has left behind all the people who love him made us reflect on our own life despite the intellectual peace we have made with ourselves. Hughes’ death has instilled a sense of pride in me – for him and for the game. When I gaze at the stars at night, I think I might watch cricket again to keep the spirit of this inspiring man alive.